Oh no! You want to bake some cookies and need softened butter. Guess what. You can do this. 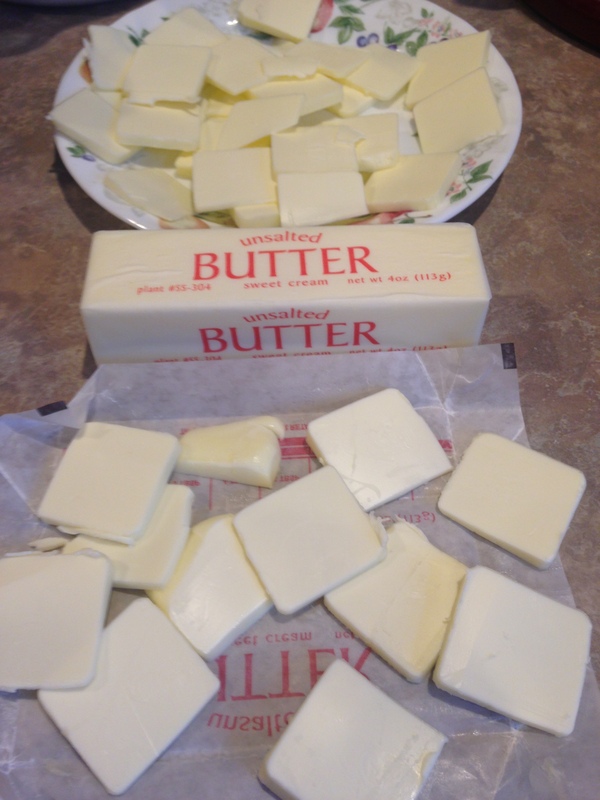 Take out that stick of butter and cut into 1/4 inch slices. Let sit out for 15 minutes and you have softened butter for your baked good. Did you know about Panades? A panade is a paste of milk and bread that is typically used to help foods like meatballs and meatloaf hold their shape and moisture. While it may sound odd to use a panade in a sauce, America’s Test Kitchen science editor explained why it works: Starches from the bread absorb liquid from the milk to form a gel that coats and lubricates the protein molecules in the meat in the same way that fat does, keeping them moist and preventing them from linking together to form a tough matrix. Mixing the beef and panade in a food processor helps to ensure that the starch is well dispersed and all the meat reaps the benefits. 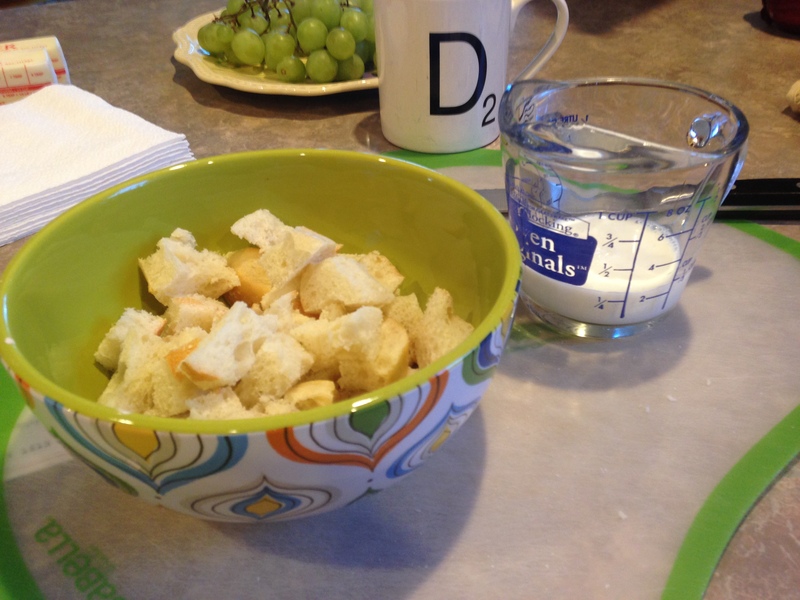 However, the gel does not begin to form until the meat-bread-milk mixture is heated. Under heat, the coating of gel on the pieces of protein prevents them from chemically reacting with each other and resulting in toughness. A friend from work (Karen) has lots of herbs that are growing on a hill in her back yard. She brought in some chives, oregano and lovage to share with everyone. I had never heard of lovage before she introduced me to it. It is similar to celery. The plant has a hollow stem and the leaves look like large celery leaves. 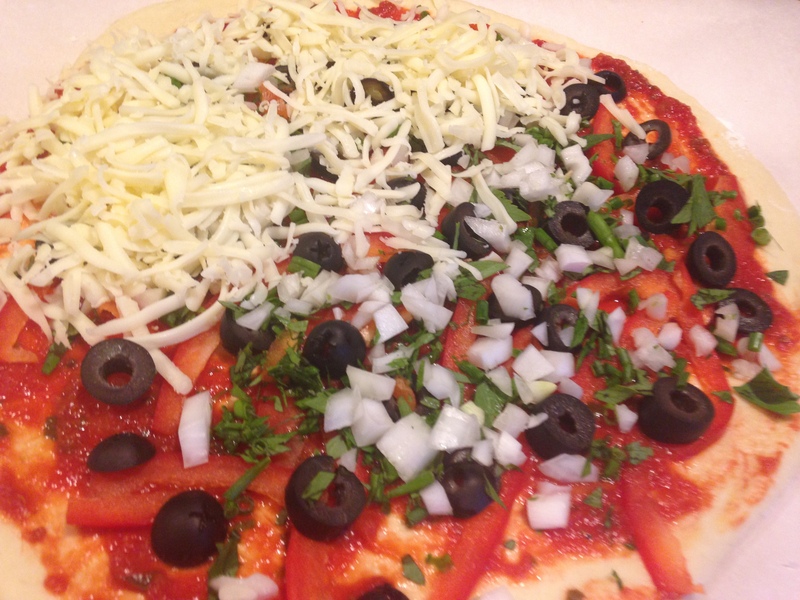 I used all the herbs she gave me in cooking, salads and on a pizza. They were delicious! 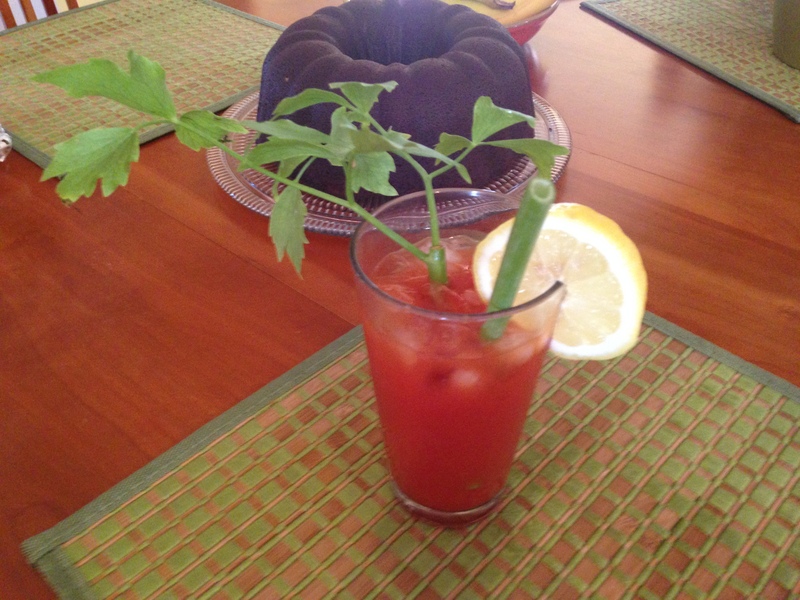 Karen mentioned that I should make a Bloody Mary and use the hollow stem as a straw. Well, I just couldn’t resist! Would you? Thanks for sharing Karen. Anytime you want to unload some herbs from your hilly garden, I will gladly take them off of your hands. They were awesome, especially the lovage. Cast Iron Skillet – Best non skillet frying pan, EVER!! Do you own a cast iron skillet? Once they are seasoned – and that doesn’t take too long – this is a great non stick skillet. I love my cast iron skillet. My favorite food to make is pan fried steaks. I season each side with kosher salt and freshly ground pepper,add 1-2 Tablespoons of oil over medium heat until shimmering, add steak and pan fry each side 5-7 minutes, let rest 5 minutes and you have a simple and delicious steak. I have a Lodge Cast Iron Skillet. Very reasonably priced – $26.95 – and this will last you a lifetime. Here is how to take care of your skillet. I got this information from their website. Hand wash. Dry immediately—even before first use. Rub with a light coat of vegetable oil after every wash.
Why? To keep the iron “seasoned” and protected from moisture. If no soap is too scary, wash with mild soapy water and dry and oil immediately. (I DO NOT use soap, water and heat work together very well to clean my skillet) Consider that cookware is 400ºF in 4 minutes on medium heat and is sterile at 212º F, so soap isn’t always necessary. “Seasoning” is vegetable oil baked onto the iron at a high temperature: not a chemical non-stick coating. Seasoning creates the natural, easy-release properties. The more you cook, the better it gets. Because you create, maintain, and even repair the “seasoning”, your cookware can last 100 years or more. (If I have 30 years I’ll be happy!) Chemical non-stick coating cannot be repaired, limiting lifespan. Cast Iron rarely needs to go above a medium heat setting when properly pre-heated. For the times when you do cook at higher temperatures, add oil to cookware just before adding food to prevent sticking. Our handles get hot; use mitts. Use trivets to protect countertops from hot cookware. Did you know this about taste buds? Now I know why I hated asparagus when I was a kid and love it now!! The older I get the more I find out how much I lose. What is that about? I checked to see if I could find some more interesting facts about our taste buds. Here are a few more for you! There are 5 basic tastes; sweet, salty, sour and bitter, there is a fifth taste, umami, from a Japanese word for “pleasant savory taste” and is distinguished from saltiness. Umami?! Soy sauce, fish sauce, celery, cheeses…add umami to your dish. Works fabulously!! I shall save that for another time!! Eric made a calendar with fabulous photos of food for a project for school. I was the lucky winner of this fun calendar. For the month of May there is a photo of some barbecued ribs. The reason; May is Barbecue month!! 2. The most popular foods for cooking on the grill, in order are, burgers (85%), steak (80%), hotdogs (79%), and chicken (73%). 4. The most popular flavors of barbecue sauce are hickory, followed by mesquite, honey and then spicy-hot. Did you know…Mascarpone cheese is not a cheese?! Mascarpone- Mascarpone is a thickened cream (with a sweet note) that is on it’s way to turning into butter. It is made from only two ingredients, whole cream and citric or tartaric acid (to thicken the cream). The process is so simple you can even make your own at home. Mascarpone should have a very smooth texture with no lumps or graininess. The flavor should be milky and lightly sweet. It tends to go bad quickly, so use an open container of mascarpone within a few days. I use Belgioioso Mascarpone. Belgioioso is a northeast Wisconsin cheese company. Love their cheese!! 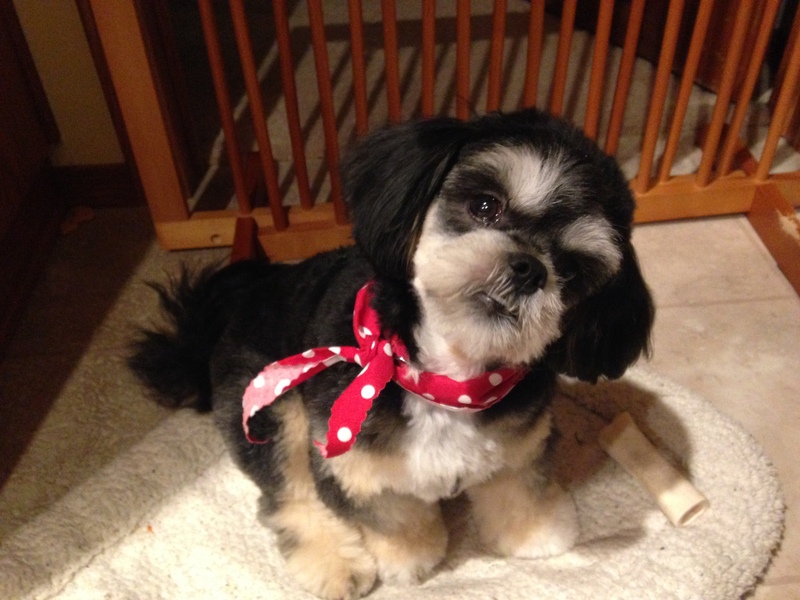 Lily and I went to the Olive Cellar Saturday. 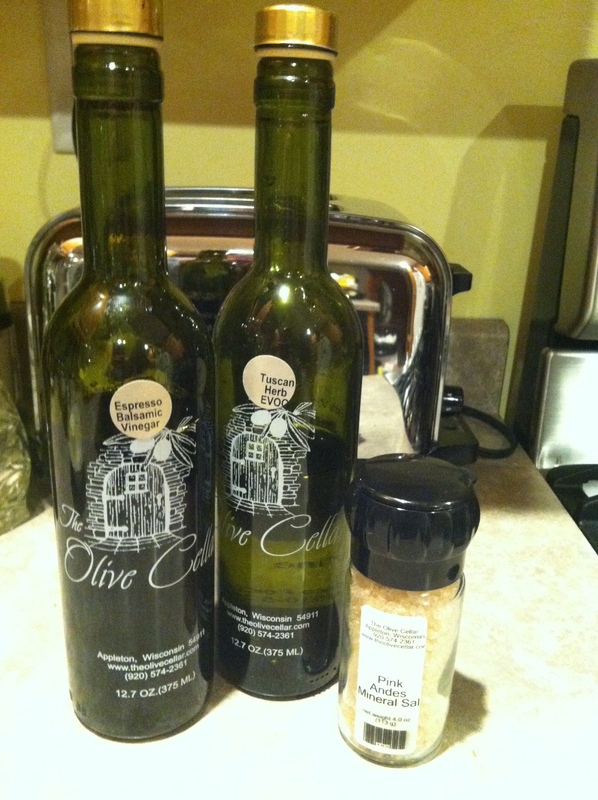 The Olive Cellar is a specialty store in Appleton WI that sells olive oils and balsamic vinegars. This is a very fun store. You need to check it out! I ended up getting their Tuscan Herb Olive Oil, Espresso Balsamic Vinegar and Andes Mineral Salt. There are many uses for balsamic vinegar. I happen to use it for salad dressings and marinades. Did I ever think of using it for a topping for ice cream??? Not really. The salesperson at The Olive Cellar recommended it. I figured why not?! 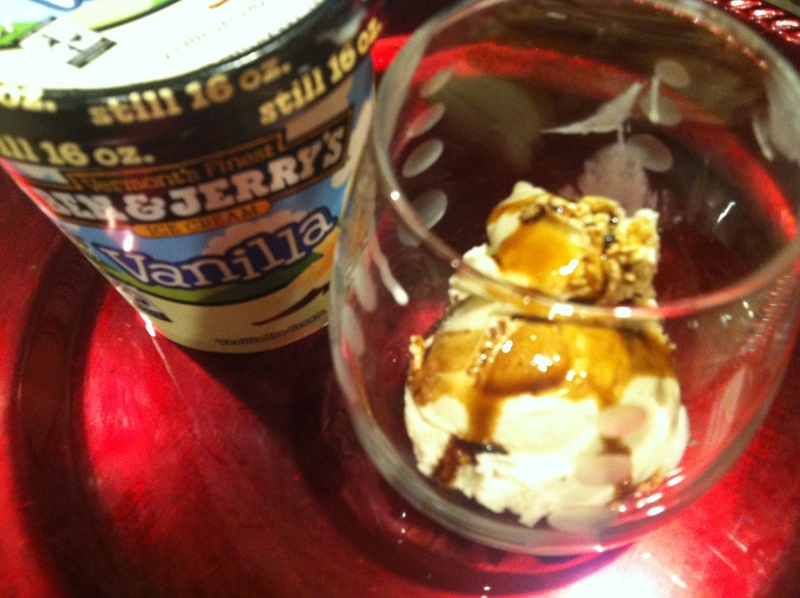 I topped Ben and Jerry’s Vanilla Ice Cream with Espresso Balsamic Vinegar. Well, this couldn’t be simpler or more delicious. I will definitely start using Balsamic Vinegar with my desserts. Give it a try! My beautiful crockpot and very busy photo! The crockpot was invented in 1971. The crockpot cooks on low at 160 degrees. The crockpot cooks on high at 190 to 200 degrees (always below boiling). Crockpots come in different sizes from 1 pint to 7 quarts. Crockpots use as much electricity as a lightbulb. No matter how tempting DON’T lift the lid while it’s cooking (unless the recipe calls for stirring). Lifting the lid will enable heat to escape. Ground meats should be browned and drained first. One hour on high equals 2-2 1/2 hours on low. Always thaw meat before placing in crockpot. If you live in high altitude (Scott and Kathleen), cook for an additional 30 minutes for each hour of cooking time that the recipe calls for. I have a beautiful crockpot and definitely don’t use it as often as I should. Anyone have some decent crockpot recipes? If you do I would love for you to share them or the link to get the recipe. Maybe I will get inspired for some Simple and Delicious recipes! Ciao!! Pancetta is often called Italian bacon. Unlike American bacon which is often smoked, Pancetta is unsmoked pork belly that is cured in salt and spices such as nutmeg, fennel and pepper. Most recipes call for cooking pancetta whether using to flavor stews, sauces or salads. Since pancetta is salty, use care when seasoning a dish with salt. You can keep pancetta tightly wrapped in the refrigerator three weeks or freeze for up to six weeks.